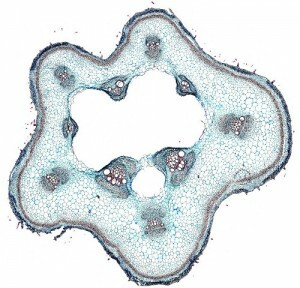 The image shows a cross section through the stem of a pumpkin. Pumpkins belong to the dicotyledonous plants. The circular arrangement of the vascular tissue indicates this. Fifty five individual images were stitched together to make this zoomable image. The final size is about 100 megapixels (10000×10000 pixels). Happy exploring!